These areas hold critical swing voters that may tip the balance in each of the nine battleground states. LEESBURG, Va. – How Virginia goes in the presidential election may come down to voters who live amid the small wineries, affluent subdivisions and Civil War battlegrounds of Loudoun County. To win Florida, either President Obama or Mitt Romney probably will have carried Hillsborough County, where the urban seaport town of Tampa bleeds into communities of Spanish-speaking voters and retired Midwesterners. The race may come down to an even narrower slice of the electorate than the nine most contested states: Colorado, Florida, Iowa, Nevada, New Hampshire, North Carolina, Ohio, Virginia and Wisconsin. The outcome probably will depend on what happens in the 106 counties that Republican George W. Bush won in 2004 and that voted for Democrat Obama in 2008, according to an Associated Press analysis. These counties are home to people such as Matt Blunt, a 42-year-old IT manager from Sterling, Va., in Loudoun County, outside Washington. Blunt voted for Obama in 2008, hoping he could change Washington’s bitter tone, but now backs Romney. In these counties more than anywhere else, voters’ phones ring every night with automated telephone surveys. Every day, glossy mailers hit their mailboxes. Televisions crackle day and night with campaign ads. “There’s more – and more concentrated – contact with voters in these counties that swung back and forth in these states than anybody,” said Charlie Black, a veteran Republican presidential campaign strategist and informal Romney adviser. In northern Virginia, for example, Obama is reaching out to newcomers and younger veterans. 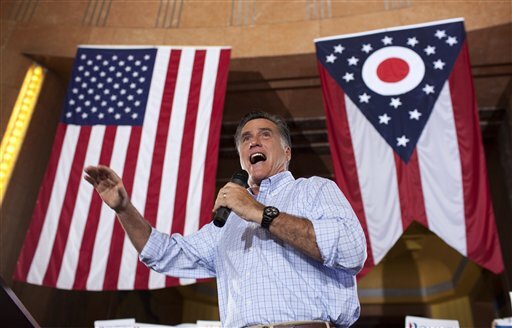 Romney’s pitch is stronger toward retired military members, sportsmen and social conservatives. As a whole, voters in these counties are less racially diverse than the nation, with a smaller percentage having a college education. One such area is working-class Sandusky County, Ohio, where the automotive industry’s rebound has pushed the county’s unemployment below the state average. The list also includes parts of southern Virginia with a substantial African-American population, and North Carolina’s Research Triangle. If there’s one area where these counties are linked, it may be that many have a wide segment of working-class white voters, an important group for Romney and one that Obama has struggled with. 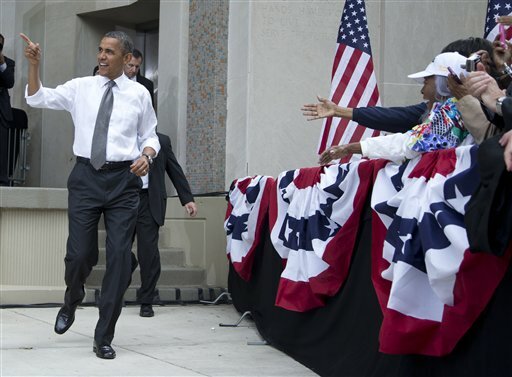 In Virginia, public and private polls show Obama narrowly ahead. Internal Republican polls have shown Romney leading in Loudoun and Prince William counties. Over time, these once reliably Republican counties have become more politically diverse, as younger, well-educated, racially and ethnically diverse voters have flocked to Washington’s suburbs. Obama won four years ago by aggressively going after them and the state’s robust African-American electorate. Romney can win Virginia by taking Loudoun County away from the Democrats, holding down Obama’s likely edge in other Washington suburbs, and running up big numbers in rural southern Virginia and the conservative Tidewater area. But some swing-voting counties don’t look like they may be swinging back any time soon. The shift of these typically Democratic-leaning voters, as well as other Spanish-speaking voters in Colorado and Nevada, is part of a longer-term trend going in the Democrats’ favor and spreading into neighboring states over the coming generation.